Today is going to be a weird day for me. I knew it was coming, just like I knew my alarm clock would blast me out of bed this morning and send me careening toward the inevitable, but that doesn't mean I was looking forward to it. It takes a special person to wear The Suit, and I'm not sure I'm cut out to be that "special person." I can get grumpy at times. Being cheery doesn't seem to be my Number One attribute. Somedays, because of the depravity men inflict upon there fellow men, my heart is heavy, my soul empty, and I see no reason to make merry or to even smile. Sure, I can fake it, and there are times when I actually am in great spirits, but doesn't The Big Guy have to be cheery all the time? These are some of the questions I've asked myself, never coming up with a clear answer. 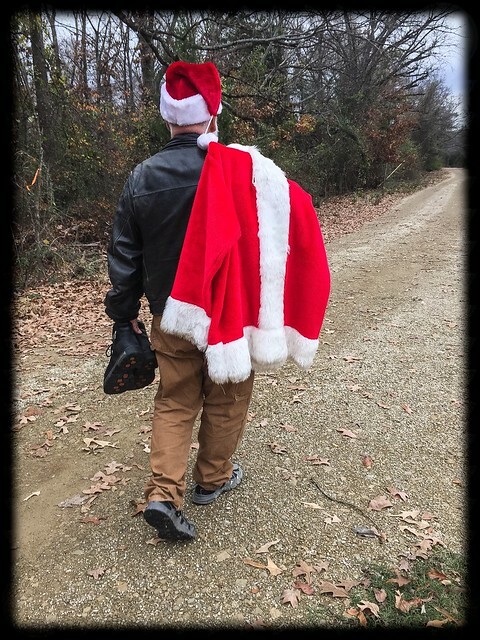 Nonetheless, today I will try to set aside all doubt, worry and sadness, and let The Spirit of Christmas be my sword and shield, as my father did before me, and his father before him. Today I leave home to take over the family business. Today I am Santa Claus.